While your local trails are snow covered, join us for saguaros, sunshine, Sedona and singletrack! 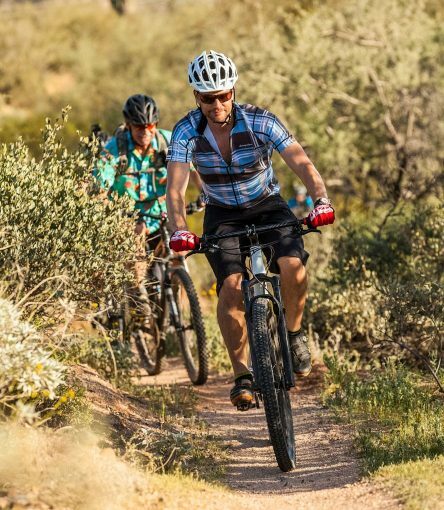 This self-guided mountain bike trip begins in the Sonoran Desert with a wide variety of trails to suit intermediate to advanced riders, then transfers to Sedona to finish out the week. The trails near Scottsdale, Arizona will astound you, with over 200 miles of new, purpose-built, fast and flowy singletrack. Temperatures often reach 70 degrees on winter days, perfect trail conditions. 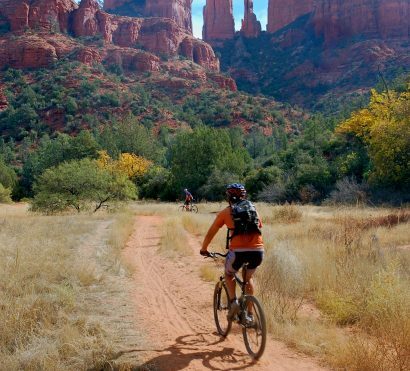 During the second half of the trip you’ll explore Sedona, a red rock playground of slick rock, hard-packed silt and ledge-filled rides beneath an azure blue sky. 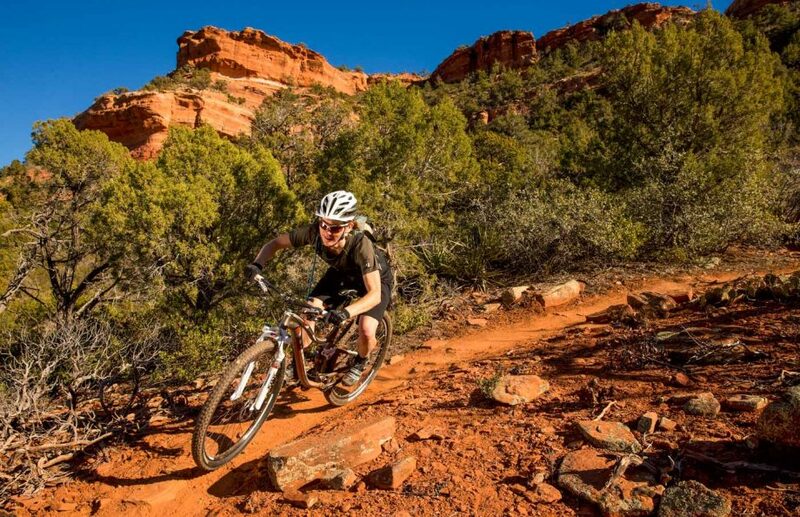 Well-known by sightseers and new age spiritualists, Sedona is also home to some of the best mountain biking in the country. Available November 1 – April 30. A bike and helmet are not included with the cost of this trip. This trip is available November 1 – April 30 upon request. 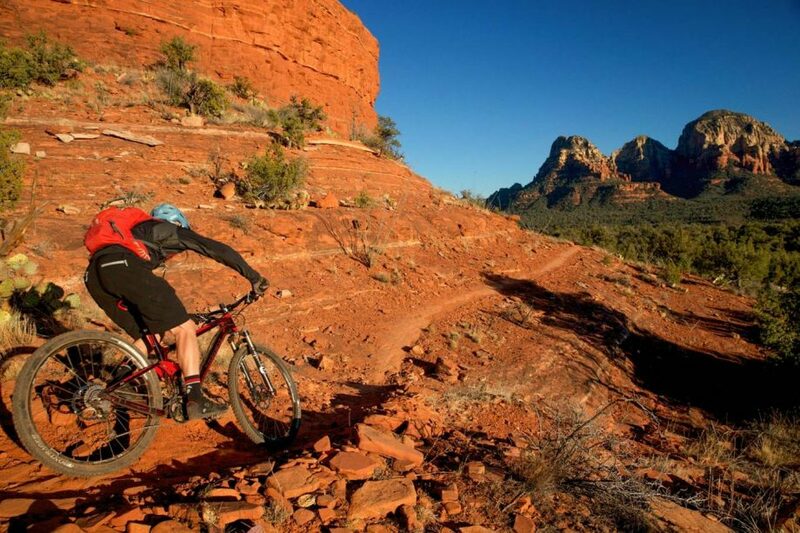 Ride Sedona's world-famous red slickrock and experience the warm winding singletrack of the Sonoran Desert all in one trip. This program includes guided rides each morning and self-guided, independent afternoons and evenings. It is available in winter and spring. This makes for the perfect combination of support and independence for as few as 2 travelers- starting any date you wish! Between 1 – 4pm – Meet at the AOA headquarters in Scottsdale for orientation. During orientation, your trip consultant will review all of your reservations and planned rides, make some additional suggestions for how best to enjoy the local area, and if you rented a bike, will walk you through bike set up and bike rack installation on your rental car. After orientation you will have time to get out on the trails nearby if you wish, or to go exploring in town; just ask your trip consultant for suggestions! 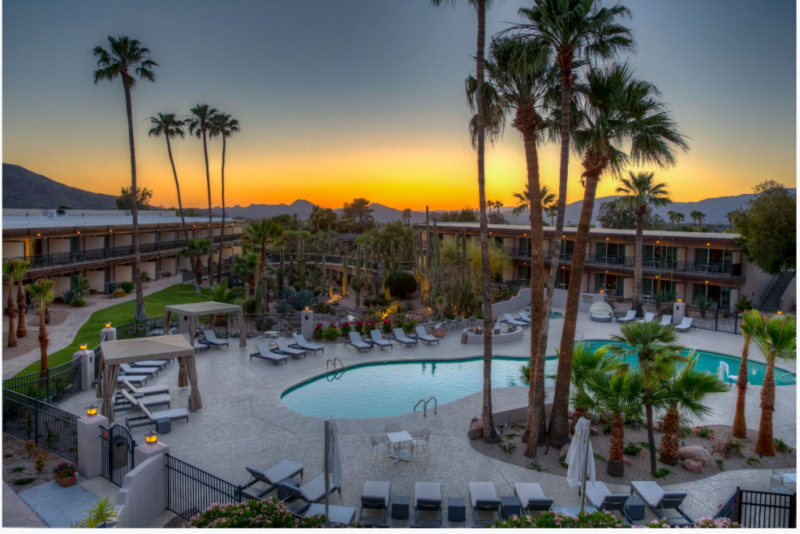 Your hotel is in relaxing Carefree, next door to the cowboy town of Cave Creek. Get your western on! One of the western USA’s newest trail systems, Brown’s Ranch is arguably one of the best outside of Utah and Colorado for both the length of rides and diversity of skill levels that the trails provide. Beginner to advanced cyclists will find something here. Flowing singletrack, coupled with breathtaking views of open desert and towering mountains, makes this system one of the most fun places to ride. This morning, you will meet one of AOA’s expert mountain bike guides at the trailhead for about 3 hours of guided riding. The trails chosen will be based on your skill level. Feel free to ask your guide any questions about the surrounding area. Count on riding with your guide for 3 hours, concluding back in the parking lot at noon. 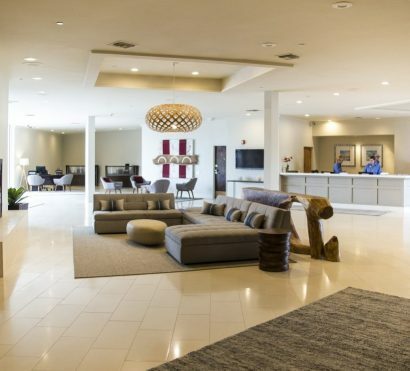 The rest of the day is yours to ride more as you please, grab lunch nearby, lounge by the pool at your hotel, or visit some of the many sites Scottsdale has to offer! 20+ miles; 3 hours, minor elevation changes overall, but short, punchy climbs are common. Fit road riders and moderate level mountain bikers will be comfortable. 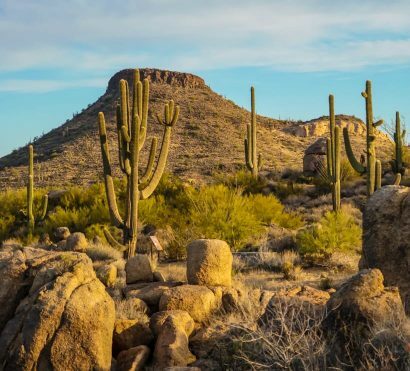 This morning’s guided ride explores the McDowell Mountains, riding through Scottsdale’s McDowell Sonoran Preserve and into the McDowell Mountain Regional Park. This area is a wilderness corridor connecting directly into the massive Tonto National Forest, creating a habitat for a wide variety of plant and animal life. Keep your eyes peeled for gambel’s quail, jackrabbits, desert tortoise or even maybe a bobcat! The ride will warm you up with a fun downhill leading to some of the most fun cross country mountain bike trails in the Southwest. A long loop around famous Pemberton (home of the Javelina Jundred endurance trail run) and Escondido trails will cover almost 3 hours; but don’t forget, what goes down must go up! Your ride finishes with a long gradual uphill back to the trailhead. Once again, the afternoon is yours to enjoy all that towns of Carefree, Cave Creek, and Scottsdale have to offer. 25 miles; 1,100 feet + elevation gain. Flowing, fast and mostly smooth. This is your last ride day in the Scottsdale Sonoran Desert, and we offer some choices today based on your skills and preferences. 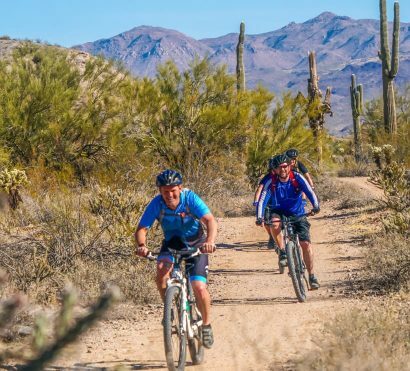 We can go back to Brown’s Ranch and ride terrain you haven’t covered if you enjoyed the first day’s ride, or we can take you to similar terrain at the Phoenix Sonoran Park system that includes a little more climbing with mostly smooth, flowing trails. 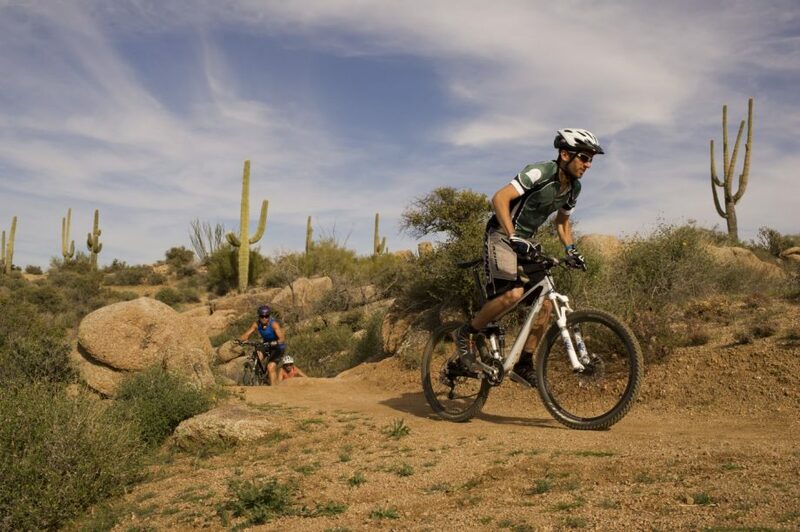 For more challenging riding, we can do Spur Cross Ranch near Cave Creek. After the ride, you can return to your hotel, checkout, and travel on your own to Sedona (2 hours by car). 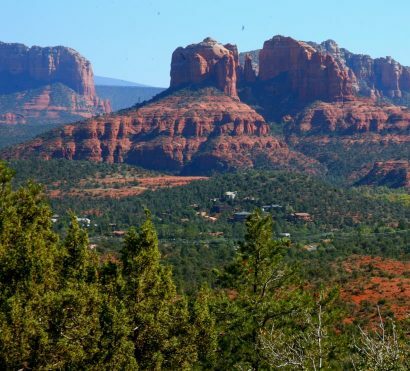 In Sedona, check in to your hotel and explore the town! We include suggestions on what to see and do, as well as excellent dining choices in the central part of town. After breakfast, get ready to ride! Here in Sedona the trail conditions are quite different than what you’ve experience so far. You will have a local guide to spend the mornings with. Your guide will meet you to go over the rides, answer any questions, and adapt the ride to your abilities. 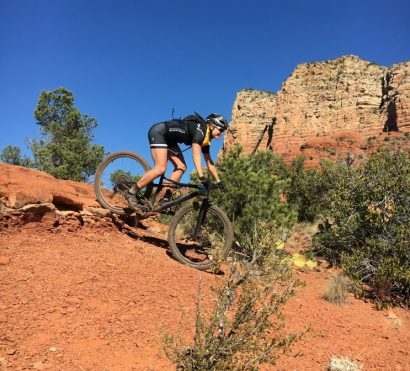 After lunch, you can ride on your own if you desire, but we also recommend enjoying some of Sedona’s amazing hikes such as Cathedral Rock, which begins right in town. Some travelers may choose to relax poolside with a book for a little recovery time! Tonight, we have you covered with suggestions of Sedona’s best post-ride dining experiences. 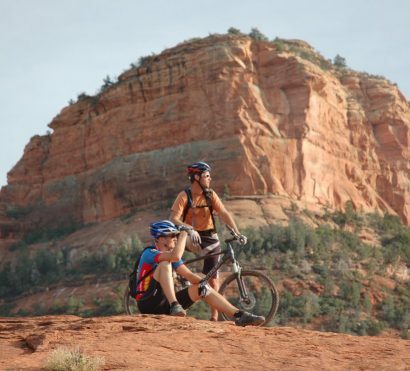 Today, riders will venture into the Upper Dry Creek Trail system located on the west side of Sedona. Three sides of this trail system sit in the shadow of the sky-scraping cliffs of the Red Rock Secret Mountain Wilderness, which makes for world-class scenery at every stage of the ride. There are numerous options in this system, but we will likely start with a classic loop: Long Canyon, Deadman’s Pass, Aerie, Cockscomb, Dawa and back on Arizona Cypress Trail. This loop provides challenge while giving riders a chance to ease into the day on gentler grades and terrain. After the ride, your guide will provide numerous additional suggestions for loops you may choose to ride this afternoon or for a few great hikes in the area. 19 miles; 3 hours of moderate level of skill and up required. Almost all singletrack with the occasional rock obstacles and short punch ups. Today, you get a final half-day guided ride; perhaps you’ll take a spin beneath Steamboat Rock on the Jim Thompson trail and explore the Soldiers Pass Area, or venture down another of your guide’s favorite local trails. After checkout from your hotel, enjoy a celebratory lunch in uptown Sedona before the easy 2 hour drive south to your bike return at the AOA office before you head on to the Phoenix Airport or an extra night in the city. Ask your trip consultant for recommendations. 8 miles; up to 3 hours; moderate to challenging depending on your wishes for this last day.